We share the inside story of revamping our own website including what was wrong with the old site, what changes we made, the tools we used and how we promote and measure the new site. Landing page: The (OLD) main page had been optimised for SEO, but content was duplicated and information architecture was not as crisp or intuitive as it needed to be. This could lead to breaks in the sales funnel, confusion or an impression that the content hadn’t been fully thought out (not ideal for a marketing company). Messaging: While messaging across the site was consistent and strong, it wasn’t fully in line with the scope of services we offer in 2019 (and those that drive the most revenue). Too much copy: There was simply too much text on the site — distilling copy to the minimum possible volume is tough, but it’s well worth it. Navigation & design: Since our last update, several different people had added pages or updated content, leading to less than ideal site navigation and a lack of consistency in design and branding. 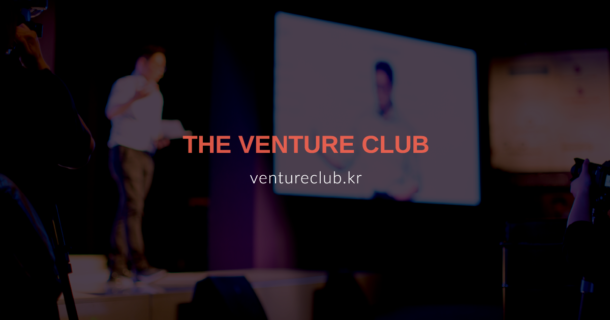 CTAs (call-to-action): We had a pop up requesting visitor email addresses in exchange for a downloadable Korean Startup Ecosystem overview. That’s great, but the pop up was ugly and could be annoying – it needed to be improved. The meta-description of the website in Google was not optimized for the range of services we currently offer (this is the short blurb that accompanies search results). This meant that our relevancy score was lower than it should have been for relevant searches. Individual page URLs were not optimized, meaning that beyond the main page there were non-relevant strings of characters. They are now short, elegant and relevant to the page content. Relevant file names for images were missing, meaning that Google couldn’t index them for relevance and they didn’t come up in image searches for G3 Partners. Use of page ‘tags’ within the site were also missing. They are keywords on the backend that accurately describe the content on each page. This meant sub-optimal SEO. On our new site we included these tags underneath page headings, visible within the main page content as well as on the backend. Our company blog was previously hosted on Medium, so some of the traffic was lost. It’s now on our website. Google will be making HTTP websites unsearchable, because they are not secure. We updated our site from HTTP to HTTPs — a quick, but important fix. There are certainly cases where coding your website from the ground up is important. For example, if your product is an e-commerce site and requires a payment gateway, or if banking grade security on the site is a critical issue. In these cases it can be assumed that you have the technical capabilities in-house to be able to code a site to your unique requirements. 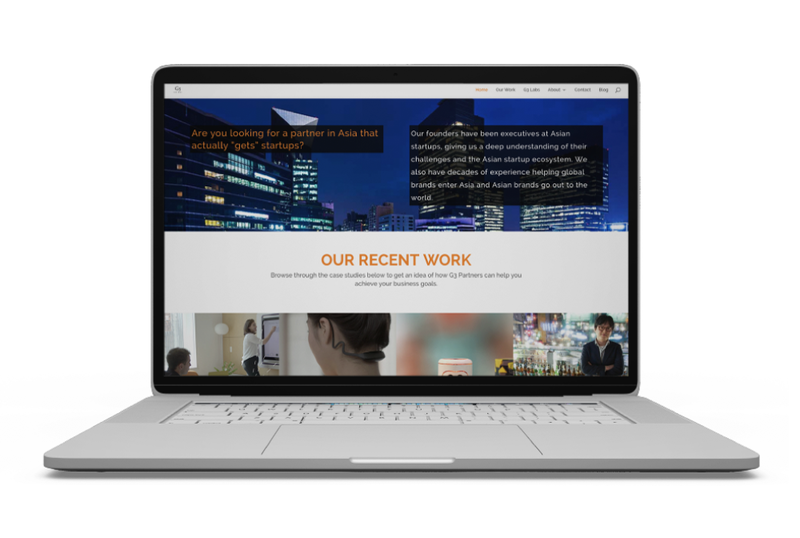 Most clients we work with use their website as their public-facing ‘Marketing HQ’. In these cases, it serves as an information portal about your company for customers, partners, investors, the media, etc. Using customizable templates is faster, easier and cheaper. A template also makes small updates possible without the need to code. Before you start writing content or creating designs, take a step back and ask yourself what are the critical goals your site needs to achieve for your business and therefore, what really needs to go onto the site and in what order. At this stage you should also decide which pages are required to achieve your goals most effectively. Our clients often want to put far more pages on their site than is really necessary – keeping things as simple as possible is a good rule of thumb. In most cases your website is not intended to replace your sales team, but rather to increase the number of inbound leads – a good website sparks interest and your sales team closes the deal. Similar is true if your website needs to spark interest from partners, investors or the media. The above isn’t true for e-commerce websites where the website is often the marketing channel and the point of sale. Our designer reviewed the current site and developed a list of recommendations for which pages should be included (or excluded). That was reviewed with the executive team. 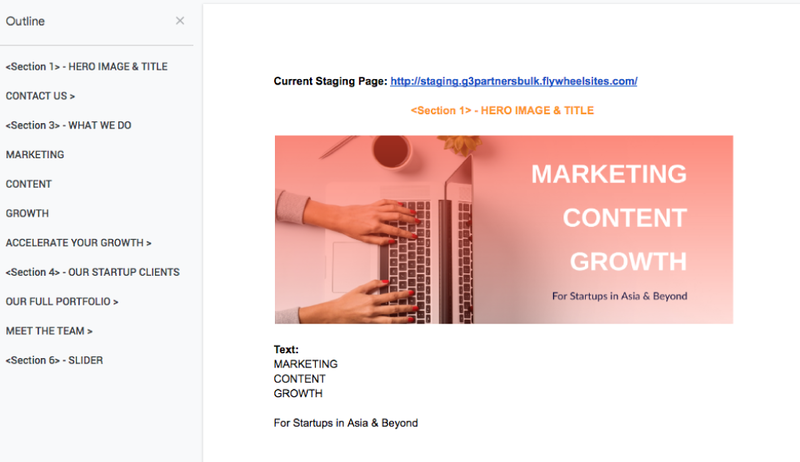 We created a basic layout for each page in Google Docs (no specialist tools required yet). Google Docs allows easy tracking of changes and enables multiple people to weigh in with suggestions in real time. Each page included a basic description of what was to appear on the new site, along with suggested images and content boxes. Determining volume of content at this stage ensures that the recommendations for final layout are met. It also keeps you focused on being concise. As a content agency we really do believe that content is King! A beautiful site that doesn’t achieve your company goals is near-useless. Content on your website needs to speak to your intended audience. If you’re a law firm that works with startups, then use startup-friendly language. If your target is teens in the USA, then don’t use technical jargon — your content should be fresh and bubbly. It’s very easy to over-promote yourself and it’s easy to include too much information. Remember, most company websites are intended to grab interest and inspire confidence in your brand, rather than confirm a sale. Go only as deep as you need to and let your sales team take it from there. The content on your site should follow an overall narrative. The first page should give an overview, then use sub-pages to provide more specific detail. We kept the front page as clean as possible and built full SEO into the site on sub-pages and on the backend. WordPress is still one of the world’s top website platforms. It features a comprehensive plugin architecture that allows you to add a full range of pre-built features either for free or for a small fee. While it is most associated with blogging, it’s also the default platform for many website builders. 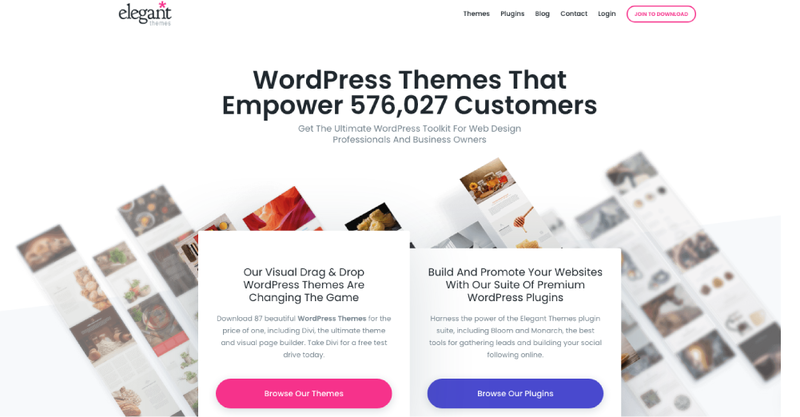 Theme/template: Divi (by Elegant Themes) – In their own words, “Divi is an insanely fast and incredibly intuitive front end [website] editor like nothing you have seen before.” We have found that to be largely true. They have a large range of cost-effective templates that are easy to customize without needing to code. Web design tool: Divi Builder (by Elegant Themes) — This is a more advanced tool from Divi that enables a higher level of template customization. It also has a great tool that enables you to visualize the site as you build it. Both Moqups and Figma are great tools that allow you to build a mockup of your website to share and get feedback from your team in real time from a single project dashboard. They are also useful for other collaborative design-focused projects. 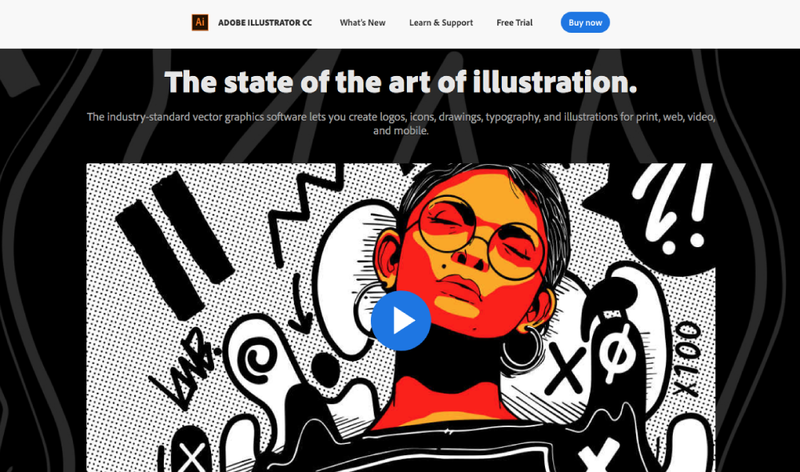 Adobe Illustrator – A pro-level tool to create logos, icons, sketches, typography and other vector art. We use it extensively for custom graphics. 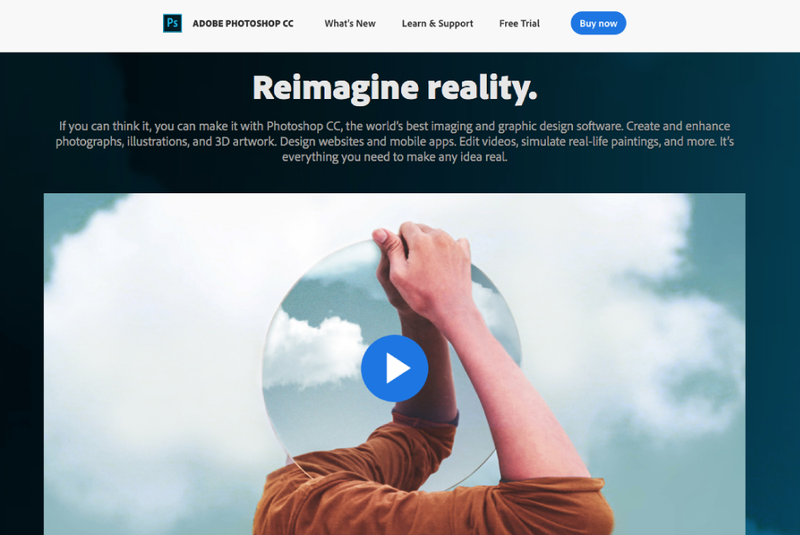 Adobe Photoshop – Probably the world’s top photo editing tool. But far beyond enhancing your photos, Photoshop allows you to create and edit any image or design. We use it to create customized graphic elements from scratch or edit any existing graphics or images. After launching, but before announcing our new website publicly, we did a comprehensive internal audit. Four people that weren’t involved in building the new site tried to break it, tested the information architecture for flow and made sure links worked properly. Don’t skip this step! While your team is testing the site there’s also a final checklist of to-dos for your website team. Update your Google Search Console (this ensures that Google is indexing the new site, rather than the old version) and install Google Analytics if you haven’t done it yet. Install Hotjar that gathers data on your website’s user experience — it includes a detailed heat map, enabling you to precisely track the user journey on your site, by website visitor. This provides critical data for further site optimization. Record the day that you launched the new site, so you can accurately track traffic data and make further improvements. Install Facebook Pixel – this tool will be a great asset for your Facebook/Instagram ads retargeting. Utilize Google URL Builder to create unique, trackable links for anything you share from your site. For example, if you share a blog post on LinkedIn, Facebook and Twitter you can track which channel delivered the most / best inbound leads. After launching the site we also conducted an SEO audit using a WordPress plugin called Yoast. This highlighted any backend issues (e.g. broken links, etc) and gives recommendations on improving content. For example it flagged that we’d used the same word to begin three consecutive sentences — this is not good for SEO. Using Google For Developers PageSpeed Tools we performed an assessment of the website to ensure optimal loading speeds across the site. Among other things, this included ensuring that all image files across the site were no greater than 700kb. Launching a new website may not seem like big news, but for you and your customers it really is. A new website can drive more traffic and increase conversions. Telling your community about the new launch will result in a short term (large) spike in visitors. Some of them could become repeat or new customers. In our case, the new site is a live testimonial of our work and could lead to paid website projects in the near term. It also better represents who we are in 2019. Write a blog post explaining what improvements you’ve made and how the site makes your customers’ lives better. Make sure you tell people about the new site (with a link) in your social media, including on LinkedIn. Do a one-minute walkthrough in a YouTube video. Promoting your website doesn’t need to be complicated and it’s worth the time! Need help with your new website? Get in touch – we’d love to chat about how we could help! Contact us on hello@g3partners.asia.